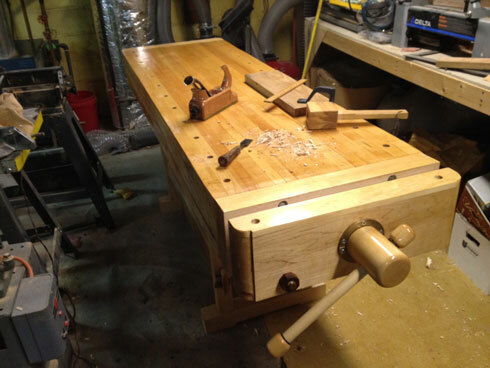 Adding our March 2013 Workbench of the Month from Keith J. of Philadephia, Pennsylvania to our Lake Erie Toolworks Blog for ease of access and historical awareness. My Name is Keith J. and I live in Philadelphia, Pennsylvania. Here is my description and photos of my recently completed ACORN WORKBENCH. Plans are by American Furniture Design. I have made some modifications to the design but nothing dramatic. The bench is 24″ wide x 80″ long x 36″ high. The top is made from 7/4 recycled rock maple glued together and hand planed. 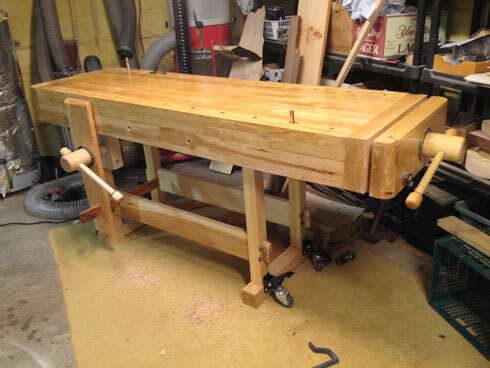 With the exception of the side vise which has a cherry jaw and a black walnut leg and some other small parts such as wedges and wooden nuts made from black walnut the entire bench is maple. 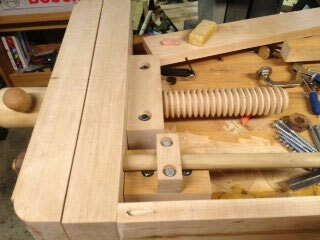 The stretchers are attached to the legs with thru mortise and tenons and held into place with black walnut wedges. The top is held in place with two 7″lag bolts. The only other bolts are the ones holding the end and side vise. Therefore, with the removal of the 2 lags and 8 wedges the top comes off the stretchers, can be removed, and the bench breaks down into 5 parts which can be easily removed from my basement shop and, hopefully, one day be moved into a new shop. I have no idea of the weight except it is heavy and I added foot operated (with some help) casters so I could push the bench aside when not in use. 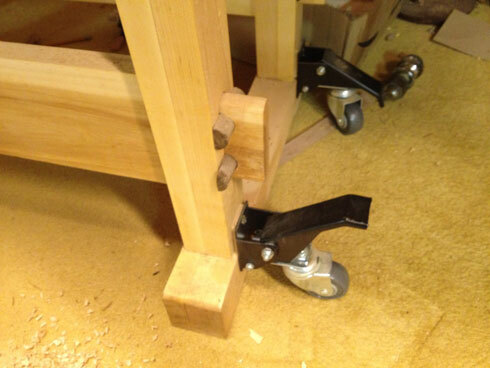 Casters were purchased from Rockler Woodworking. I finished the top with 5 coats of Bullseye clear shellac and the base, legs and stretchers are hand rubbed Walnut oil. The bench has been in use about a year and I find with a light sanding with an orbital sander with 225 grit I can easily restore the top to like new condition and the shellac dries rapidly and I can get back to work. 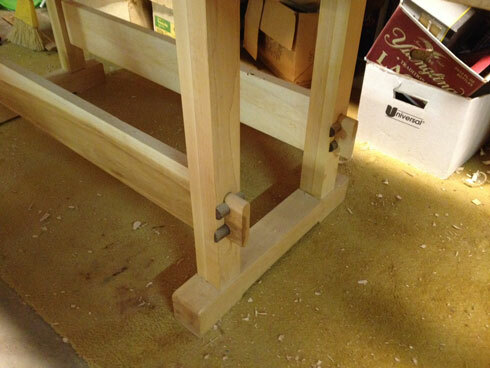 I am very pleased with the quality and ease of use of my Lake Erie Tool works wood screw vise and would recommend these to anyone who is contemplating a quality workbench. My production was delayed because I dropped a piece of 11/4 x 7 3/4 x 8′ on my right big toe and broke it (OUCH!) while at the lumberyard. I had to drive home with my left foot on the accelerator. I thought of suing but my lawyer (daughter) told me I did not have a leg to stand on.